Each week I work with over 50 children, teaching them English or working on developing other skills through the Montessori educational method. It has become part of my philosophy to individualize each lesson according to each child. Once in a while though, certain activities prove to be of great success with almost all children, so I suggest them to others as well. 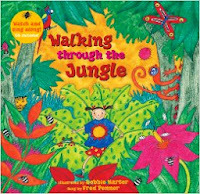 A popular activity of the last week was enhancing the wild animals vocabulary, through listening, singing, reading and discussing with the help of two great instruments from Barefoot Books: Walking Through the Jungle video and book by Stella Blackstone, illustrated by Debbie Harter and sung by Fred Penner. I often played it twice, firstly because the children asked for that, and I wanted to follow their interest, secondly because I asked them to focus on what they see, then on what they hear. Afterwards, I took out the Walking Through the Jungle book, with similar illustrations. The children loved the colorful images, and graphic of the animals. I liked the book because it presents animals together with the environment they live in, thus making it easier for them to build later on connections with countries and continents. Reading the lyrics of the song. Through repetition they consolidate their reading skills, and gain confidence to read further. After reading comes translation, for the ESL children. Make sure they all understand what they are reading / saying. Identifying each animal in relation to the environment. If you have world maps, globes or puzzle maps, it would be a good way to take the learning further and associate each environment with its place on the map. Discussions on animal behavior. Make sure they know it is normal to be afraid of these animals and to stay away from them because they might be dangerous. In the book, characters are running from the ferocious wild animals, but in the end they all gather together for supper, giving a positive psychological closure of the adventure, but also a humorous creative ending. The children laughed about what each animals was eating and how the whale "poured" water for the girl. This type of creating ending could stimulate their imagination. Some questions for that can be: What would happen if these wild animals would come at your home for dinner? What would you feed them with? Grammar activities focusing on the lyrics. Children can identify, write or mime each of the action words (verbs), naming words (nouns) or describing words (adjectives). If you have sets of plastic wild animals you could take the activity further by sorting out the animals they have seen in the book / clip. To further consolidate classification they could be sorted by color, environment, what they eat, certain skills they have such as swimming or climbing, etc. Painting or drawing with the book illustrations as inspiration. Each child can make his/her own version of the jungle, the desert or any other place described in the book. I am sure this list could go on with endless activities that can build or consolidate learning. What other books related to wild animals do your children enjoy? Have a great week, full of wonderful, sparkling learning moments!